While we all know that mobile devices have become man’s new best friend, here at Alpha Vision, we thought that we’d look at the latest 2016 trends in mobile adoption, and summarize for you the top reasons to go mobile for home builders. “Mobile to overtake fixed Internet access by 2014” was the headline summarizing the bold digital marketing predictions from 2008. 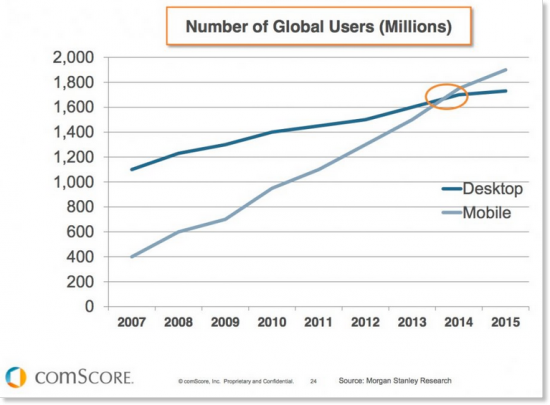 Well passed that tipping point now, the graph below from ComScore shows that those predictions were right. Looking at your own Google Analytics’ data, let’s guess that you would also have quite a similar picture of your website traffic. Embracing mobile is no longer a decision, consumers decided for everyone, and they are not going back any time soon. Among those numerous mobile users, the majority (67%) are first and foremost looking to shop different brands, products, options, etc. Shopping online doesn’t mean buying online. A huge portion of the research performed prior to an important purchase is done online. This is part of the shopping journey, as much as the transaction itself. Not investing in your website’s mobile experience in 2016 unfortunately means missing out on an increasing amount of consumers at a key step in their purchase funnel, the research. Once bashed as “the lamest generation” by The Daily Beast, millennials have been ridiculed for being too self absorbed to consider getting married and raising a family. But that’s about to change. Millennials are about to “grow up” and start moving out of their parents’ homes. Take advantage of that trend right now, before the competition does, and provide those millennials with the best available mobile experience. …Which leads us to the last point. Even though many companies invest in a mobile friendly website these days, an impressive number of consumers are still not pleased with their experience. In other words, it’s not enough to just ‘go mobile’, you have to do it right. According to Mobiquity’s independent study on the mobile technology experience, conducted on 1,000 US consumers, only 16% of consumers would give an A grade to retailers based on their use of technology to enhance their experience. And while there are several pain points along the way, the main one for non-transactional websites is brand consistency. In fact, while 39% of consumers feel brands should have the same look/feel across all channels, only 22% of website actually meet those requirements. That means there is a huge opportunity to stand up against competition for companies willing to embark on the mobile journey. And the first step in that journey is to ensure that all the great branding, experience and tools deployed on your desktop website are seamlessly displayed on mobile. 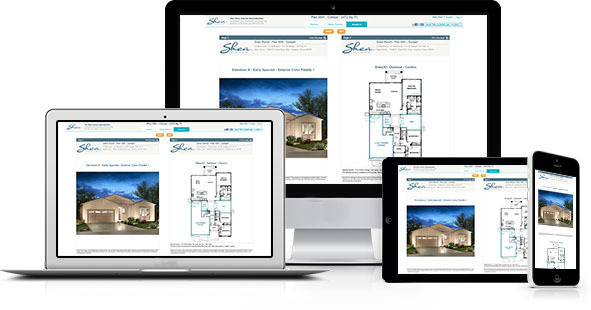 Alpha Vision’s interactive solutions, like alphaplans (interactive floor plans) have been designed to be seamlessly accessible through desktop and mobile devices, including smartphones and tablets. 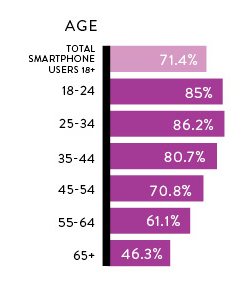 It is also our finding that 38% of our interactive floor plans’ customizations are launched through a mobile device. Take advantage of alphaplans to capture those precious shoppers at the moment of truth – while they surf your website on their mobile. Don’t miss out on this opportunity: call us today!